This false-color image of gully channels in a crater in the southern highlands of Mars, was taken by the HiRISE camera on the Mars Reconnaissance Orbiter. The gullies emanating from the rocky cliffs near the crater's rim (upper left) show meandering and braided patterns typical of water-carved channels. The surface of Mars is littered with channels that appear tobe the work of ancient water flows. Indeed, some of these channels meander backand forth like slow-moving streams on our planet. Channels can be carved bylava, wind and glaciers, but these processes can't explain all the features onMars.? "We've gotten over the hump and can now agree that waterflowed on the Martian surface in the past," says Alan Howard of theUniversity of Virginia. But how much and when is still unclear. Howard believes themeandering channels on Mars may tell us a lot about the wet history of ourplanetary neighbor. Howard and a group of researchers will be tromping into thedesert and the arctic to find terrestrial "meanders" that mightexplain their counterparts on Mars. On Earth, meandering streams occur where the floodplain isresistant to erosion. Often this is because the stream banks are held firm bygrass and tree roots. "Mars almost certainly didn't have vegetation like that,"Howard says. So what might have kept Martian soil in place? Howard andhis colleagues have a list of possible mechanisms: clay, ice, chemicalprocesses. They will be studying how these mechanisms createsinuous channels on Earth to see if they can pinpoint the bestrepresentation for what created similar channels on Mars. The work is funded by NASA as part of its Mars FundamentalResearch program. 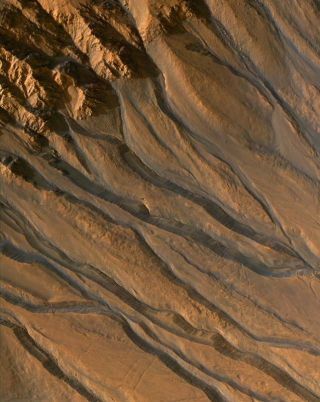 Channels can be found all over the Martian landscape. Manyare braided in a way that resembles river deltas on Earth. But there are two areas on the red planet -- the EberswaldeCrater delta and the Aeolis/Zephyra Plana region -- where the channelssnake their way through the now barren landscape. The channels were most likelycarved by runoff from precipitation, Howard says. But that doesn't jive wellwith their age, which is estimated to be around 2 billion years old or evenyounger. "The width and branching character of the channels isconsistent with episodes of rain or snow, but it seems difficult to have precipitationthat recently," Howard says. Liquid water was thought to have disappeared from thesurface of Mars more than 3 billion years ago. However, it's possible that waterflowed after that ? perhaps due to a large meteor impact or volcanic eruption thatmelted ice and created a wet micro-climate for a short period of time in therecent past. But Howard and his colleagues wonder if such a brief wetspell could create meandering rivers in the martian landscape. Are thereexamples on Earth that could help solve the mystery? Meandering rivers on Earth typically are found wherevegetation traps fine sediment to eventually form a layer of cohesive material thatis resistant to erosion. But there are places where streams meander even thoughthere?s not much vegetation around. Howard and his group have identifiedseveral such sites in the Nevada desert. "We suspect clay sediment is providing the necessarycohesion," Howard says of these sites. In the coming months, the team will visit these desertmeanders to study their geology and test whether clay is indeed able to explainthe meandering. Clayhas been detected on Mars in various locations, but it's mostly associatedwith earlier ? supposedly wetter ? epochs on Mars. "Clay implies a considerable amount of weathering,"Howard explains. ? If the meandering channels on Mars formed because of clay inthe soil, that would imply an appreciably wetter environment for a longer timeand at a later epoch than scientists have imagined. There may be other ways to make a waterway meander, besidesclay. Ice in the flow of water could hinder erosion of the banks.Howard's team plans to go to Alaska, near the town of Barrow, to see if ice isplaying a part in the formation of meanders there. Another possibility is chemical hardening of the stream bed.In arid environments, minerals deposited in the ground can cement together toform a hard thin layer. So-called "duricrusts" are common on Earth(and have been found on Mars), but the team has yet to find a meandering streamflowing through one. Howard says that the crusts take centuries to form, whichis perhaps too long to develop the erosion boundaries needed for meandering. The situation could, of course, be different on Mars. Theclimate is cooler, the surface is more iron-rich, and the gravity is just 38percent that of Earth. This last difference is something that the researcherswill be looking at closely to see what effect it has on channel formation. Lastly, Howard has considered that microbial crusts ? theclosest that Mars could presumably have gotten to "vegetation" ? mayhave provided soil cohesion. "It would be obviously revolutionary if organisms wereresponsible for the meandering on Mars, but we really have to eliminate allother possibilities first," Howard says.